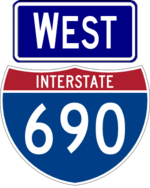 I-690 is a freeway connecting the Thruway with downtown Syracuse ending at I-481. At one time it was planned to extend from I-481 all the way to Chittenango and back to the Thruway; that plan was then scaled back to a short extension to NY 5 before being cancelled. The stub ramps at I-481 are still visible, now leading to a maintenance facility. 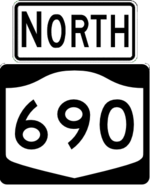 NY 690 is an extension of I-690 north to Baldwinsville. At one time I-690 began a mile to the east at the old Thruway exit 39, which ended at a traffic light; the old toll plaza is now a Thruway maintenance building. 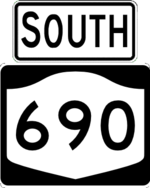 When exit 39 was moved west a mile, I-690 was extended and had its exits renumbered, though NY 690 did not recieve exit numbers. 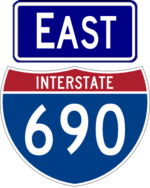 I-690 also has an active traffic light inside exit 6 (NY 695) during the state fair.